Nicole Piunno (b. 1985) is a composer who views music as a vehicle for seeing and experiencing the realities of life. Her music often reflects the paradoxes in life and how these seemingly opposites are connected as they often weave together. Her harmonic language and use of counterpoint mirrors the complexity of our world by acknowledging light and dark, past and present, beauty and brokenness, confinement and freedom, chaos and order, spiritual and physical, life and death. Nicole holds a Doctor of Musical Arts degree in composition and a Master of Music degree in theory pedagogy from Michigan State University. Her composition teachers were Ricardo Lorenz and Charles Ruggiero. She earned a Master of Music degree in composition at Central Michigan University, studying with David Gillingham. She has also worked with Jason Bahr, David Ludwig, and Tony Zilincik. Nicole earned a Bachelor of Music degree in Music Education and her emphasis was on trumpet. Her music has been performed by the Principal Brass Quintet of the New York Philharmonic, Athena Brass Band, Columbia University Wind Ensemble, the Michigan State University Symphony Band, and at many other universities and conservatories around the country. Her chamber music has also been performed at the Orvieto Musica TrumpetFest in Orvieto, Italy, the International Trombone Festival, and multiple International Trumpet Guild Conferences. Nicole suffered an injury to her orbicularis oris during her fourth year at Ohio Wesleyan. 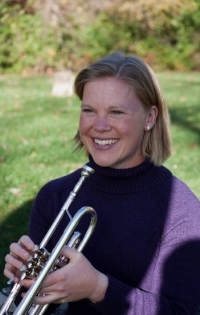 After completing a semester at the University of Michigan where she was pursuing an MM in trumpet performance, she left to have embouchure surgery. She has overcome this surgery and rehabilitation process and now enjoys playing, teaching, and sharing her experience with others.